You can add more than one checklist to each job. Use this feature to customize a guest experience by adding a VIP checklist or a “guests with children” checklist. You can also add maintenance or deep-clean checklists to any regular clean, so you don’t have to make special assignments for those jobs. Create a VIP Checklist for special clients who need a welcome basket, champagne left in the fridge, or access to property amenities that aren’t available to every guest. Create a Pet Checklist if you have pet-friendly properties that need additional cleaning when someone’s furry friend has been shedding all week. Guests with children will appreciate your Kid-Friendly Checklist where you add children’s flatware, toys, and security features to the tasks you’re assigning to your service provider. Multiple checklists make it easy to add those features for one guest, and take them away for the next. There are some maintenance checks you don’t need to perform after every guest, particularly in high season when you might have as many as 8-10 different guests in a month. But it can be difficult to get those maintenance checks scheduled separately from a clean when you have such high turnover. With multiple checklists, you can add your monthly maintenance tasks to ANY clean without needing to create a new job. If you have a guest with a special request, you don’t need to make a new checklist to incorporate that one task. If a guest accidentally drops a tray of wineglasses out on the patio, you can create a checklist that’s easily appended to your standard cleaning checklist that gives the cleaning service all the instructions they need to replace them. Adding another checklist is simple. 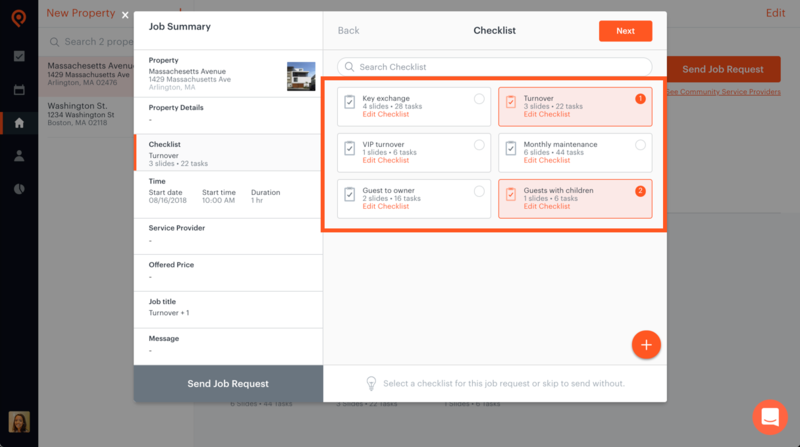 When you select which checklist you’d like to add to a job request, simply select more than one checklist. Your service provider will receive both checklists in the job.